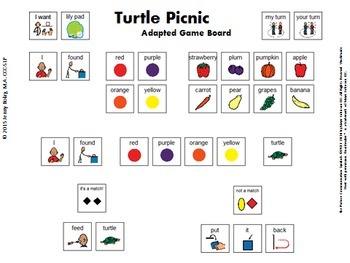 This visual (Boardmaker based) picture board for adapted game participation helps students develop functional communication skills, including basic turn taking, requesting, and commenting. It is designed for use with the Fisher Price “Turtle Picnic“ preschool game. * This visual support allows both verbal and non-verbal students to participate in an age appropriate, social early-learning activity. The therapist can provide physical models (pointing to pictures), verbal models, and hand over hand assistance as needed. Peer models may also be incorporated. 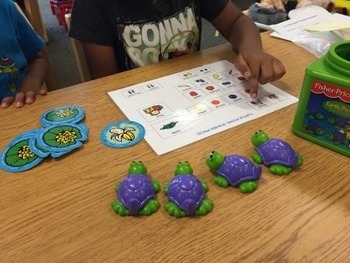 -Turn-taking skills are addressed as students are prompted to indicate “My Turn” or “Your Turn” as appropriate, either verbally or non-verbally (through pointing to pictures). *Fisher Price “Turtle Picnic” game NOT INCLUDED. © 2001 Mattel, Inc. El Segundo, CA 90245 U.S.A.
*The Picture Communication Symbols ©1981–2010 by Mayer-Johnson LLC. All Rights Reserved Worldwide. Used with permission. Boardmaker™ is a trademark of Mayer-Johnson LLC.